I’ve long been fascinated by maps. When I was a kid, it was the maps in our textbooks that always got my attention. When I read comics (most of the time), I was stare at the maps for long stretches, imagining the world of heroes and villains. When I read a book that comes with a map, I am almost always invariably sidetracked, running my finger along the lines and trying to decipher the information of the narrative along the visual latitude and longitudes of someone’s imagination. So, coming across Aaron King‘s Tumblr blog this past summer was like a present all wrapped up each day in my RSS feed. At Comic Cartography, King finds maps from all sorts of comic books and then posts them at his site. 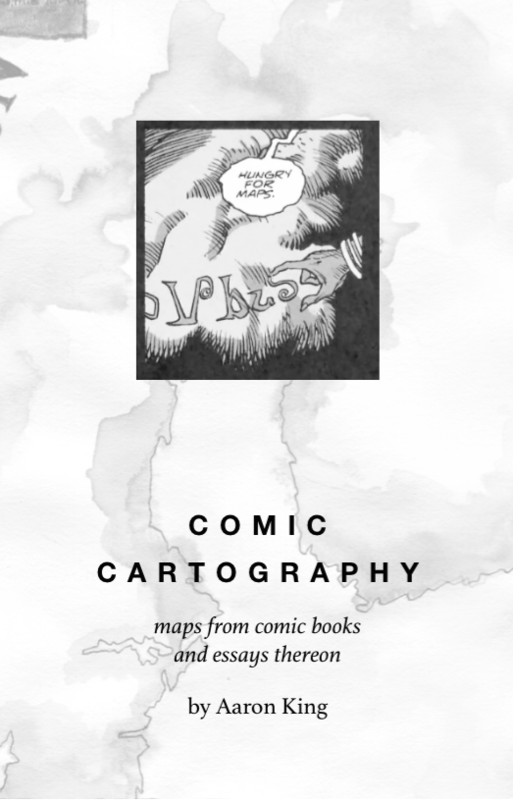 That was good, but then he self-published his own little chap book about maps called Comic Cartography: Maps from Comic Books and Essays Thereon that I just love (only five bucks!). I mean, the maps he includes are cool. But it is King’s written insights about why we love maps and how they fit into our literary terrain that captured my attention. He connects them to the theories around comics, too, showing how inferential thinking and the use of art to inform story is a key component to the comic world. King explains some unknown terms, for me, about understanding maps. Some are heterodiegetic (the maps exist outside of the story narrative — we see these at the start of a book or inked into the cover design of a book) as opposed to homodiegetic (the maps are part of the plot of the book and play a role in the narrative). 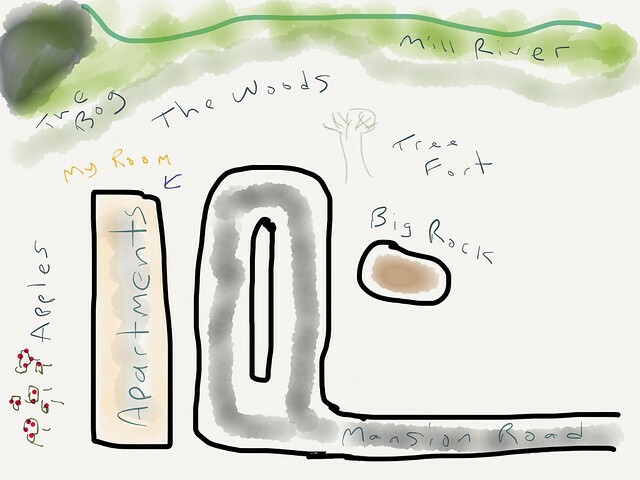 This idea of a map laying outside the terrain of the story is what fascinates me, because it comes like an invitation to the reader to take a journey beyond the story itself. It also lays down the possibility, made clear by the map, that worlds might fold into worlds, and that the writer has a larger vision than the story you are currently reading. The story, in other words, is beyond this story. You are invited to imagine. 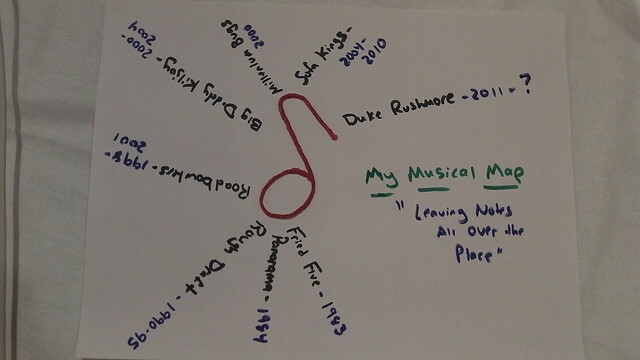 I’ve done some mapping with my sixth grade students as part of writing activities, and we have explored map making in the Making Learning Connected MOOC, showing connections within a learning network, and allowing participants to pin themselves onto a collective map. I even did a paper circuitry activity with fellow teachers, asking them to make a map with important nodes. Some chose professional circles. Others chose more personal journeys. What maps shape your world? And I wonder, is our reliance on various Map Geolocation Apps changing the way we view maps as representative of the world, and what lies beyond the edges of the known? Is our world becoming a bit too well known? What mysteries unfold off the map? 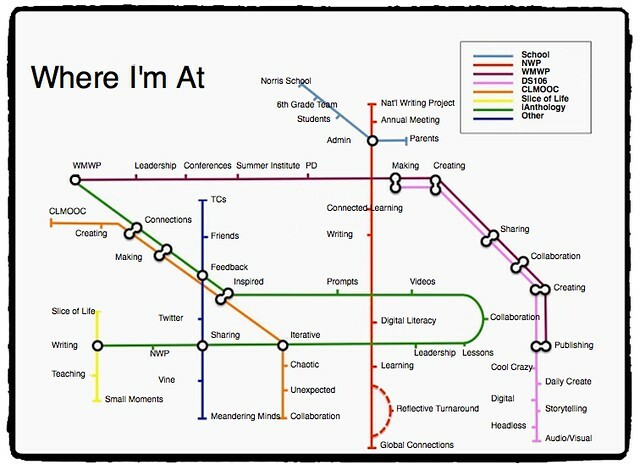 This entry was posted in books, CLMOOC, comics. Bookmark the permalink.